The FSCU-P: FriconUSA Small-Sized Condensing Unit, Premium series, air cooled condenser, is built with the best components in the market including Bitzer semi-hermetic compressors; available in capacities from 3 to 24 HP in configurations of a single compressor, or dual and triple parallel compressors. The high quality and efficiency of our products allow us to ensure our clients a highly reliable operation, low energy consumption and long equipment service life. The most common commercial refrigeration applications are centralized refrigeration for small and medium-sized supermarkets, cold rooms, blast coolers or freezers, continuous rapid cooling tunnels, block or flake ice making machines, thermal ice storage, etc. By using Bitzer Ecoline semi-hermetic compressors with infinite variable capacity control "CRII" between 10% and 100% or the implementation of an external VFD (Variable Frequency Drive) or “Varispeed Compressor” on the first compressor, we convert this unit into an incredible VRF (Variable Refrigerant Flow) system resulting in a greater adaptability to the thermal load demand and maximizes energy savings at partial load. For Extra “X” Low application temperature, a Bitzer two-stage semi-hermetic compressor with sub-cooling is used. The VRF (Variable Refrigerant Flow) option for this type of unit uses an external VFD (Variable Frequency Drive) on the first compressor. Bitzer Ecoline semi-hermetic compressor(s) with spring mounted vibration insulation, crankcase heater and internal thermal protection. For Extra “X” Low application temperature, a Bitzer two-stage semi-hermetic compressor is used. Step unloader(s) on each compressor (4 cylinders: 50-100%, 6 cylinders: 33-66-100%). Aluminum structure with galvanized steel reinforcement, high efficiency condenser with reinforced structure and aluminum micro-channel coils. Its low weight and size reduces the costs of transportation, installation and construction. Galvanized and powder coated weatherproof cabinet. EcoFriendly; Air cooled micro-channel condenser coil with internal volume reduced requires between 40% and 60% less refrigerant charge and results in a significant reduction of the refrigerant charge necessary for normal or flooded operations. Wide range of SST (Saturated Suction Temperature). Top and rear fan covers are designed to be easily interchangeable. Quiet, high efficiency, external rotor motor, AC type axial fan(s) for a better operation, configured in a vertical position. Vertical liquid receiver with inlet and outlet insulate valves, stainless steel relief valve at 450 PSI and electronic low liquid level indicator. Liquid sight glass and solenoid valve. Sealed suction filter and liquid drier for single compressor units. Replaceable core filter for units over 15 HP and all units with dual and triple compressors. Flexible joint on suction and discharge lines on each compressor. Helical oil separator with discharge check valve and replaceable 5 micron oil filter, additionally, for units with dual or triple compressors, built-in oil reservoir. Electronic oil level regulator for units with dual or triple compressors. Factory pre-charged with nitrogen and electrical work tested. UL 508A listed built-in electrical control panel. Compressor and fan circuit breakers. 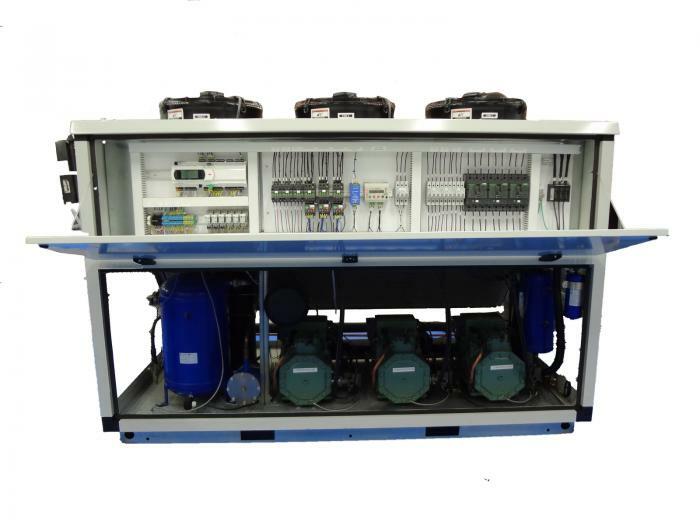 Voltage and phase-loss monitor with protection module for each compressor. Power Supply Voltage 208-230V / 3PH / 60HZ with single point power connection. Electronic Control System; compressor(s) and condenser fan(s) operational management: alarms, measurement of pressure and temperature variables, 132x64 LCD backlit built-in display with 6-button keypad. Alarm management: 3 alarms per compressor(s) (overload, pressure and oil) and 1 overload alarm for condenser fan(s). Fixed high pressure controls on each compressor. BMS (Building Management System): ModBus protocol for supervisor or HMI (Human Machine Interface).